Olmec Twins & Jaguar // "Some of the greatest masterpieces of Olmec art"
Three of the sculptures at El Azuzul shown in situ, as they were discovered. Olmec Twins & Jaguar – At El Azuzul another important monumental sculpture was found, a pair of twin males facing a Jaguar. 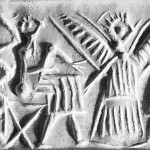 This scene offers powerful image of duality and shamanic transformation as indicated by the postures of the twins. 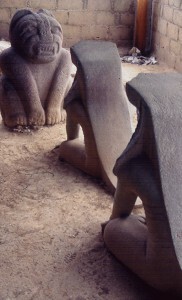 The first pair of statues, described as “some of the greatest masterpieces of Olmec art”, are nearly identical seated human figures. When discovered the two statues were facing east, one behind the other. 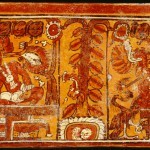 Some researchers have suggested that these “twins” are forerunners of the Maya Hero Twins from the Popul Vuh, although their headdresses have led others to describe them as priests. The twin’s headdresses have been mutilated, probably to erase identifying insignia. These photographs of the three sculptures at El Azuzul shown in situ, are as they were discovered. 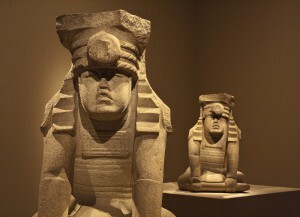 Researchers believe that these sculptures had not been moved since Olmec times. This is a sculptural representation of two young Olmec rulers, twins, paying homage to a feline-jaguar deity. Each twin, like the figure in San Martín Pajapan Monument 1, is grasping a ceremonial bar with his right hand under the bar and his left over, caught in the act of raising what has been described as an axis mundi or Mesoamerican world tree. Facing these two humans was a feline-like statue, generally identified as a jaguar. Slightly larger than the humans it faced, the feline is roughly 1.2 meters high. A 1.6 meter version of this feline was found a few meters away, to the northeast. 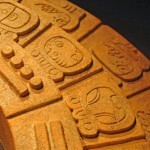 The jaguars show evidence of having been re-carved from earlier monuments. 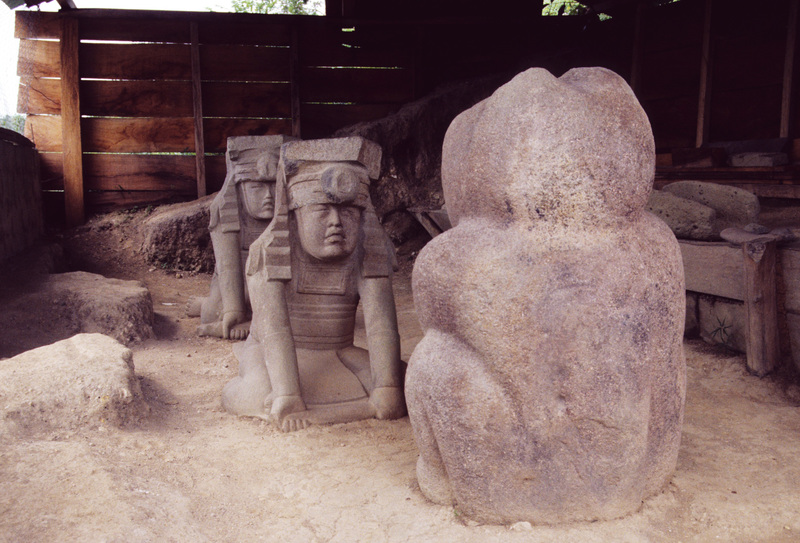 The humans are similar to other Olmec sculpture, in particular San Martin Pajapan Monument 1, where a young lord also attempts to lift a ceremonial bar. 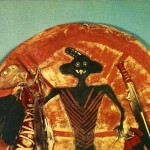 Despite its “tantalizing hints of [a] lost mythic cycle”, it is not known with any clarity what this four statue tableau illustrates.